We have been traveling a lot this year: LA, Kansas City, New Orleans, Madison, Chicago, Columbus… and as a result, we have an ever-growing backlog of posts we have been meaning to write. So, we thought it was about time that we post about a restaurant we’ve been thinking of for a while: Lilia (567 Union Ave, Brooklyn, NY). We are famously finicky about Italian food, we always figure that we can make it better (and cheaper) at home, so, other than pizza, we rarely order Italian out. But sometimes a restaurant seems interesting and special enough to lure us out of our old habits, and that was the case with Lilia. Lilia is the brainchild of chef Missy Robbins, and was named as one of the best new restaurants in 2016 by the New York Times and Time Out New York. The restaurant is definitely scene-y, and we were certainly not cool enough to be there among New York’s buzziest. And I can’t say we were made to feel particularly welcome: even though we had a reservation early on a Thursday, we still had to wait about a half hour to sit, all the while waiting awkwardly in the vicinity of the bar, because the bar itself was completely full. Though in the meantime we did have time to explore the interesting space – which used to be an auto repair shop – and the menu. The menu was divided into small plates and entrees, but we opted for small plates to share. The pasta is all made by hand, and we heard only great things about the sorcery of Missy Robbins, who cut her teeth as Executive Chef at Chicago’s Italian icon Spiaggia from 2003-2008. More precisely, the menu is divided into cocktail snacks, antipasti, “Little Fish,” Pasta, “Big Fish,” and Meat. The cocktail snacks are sort of like appetizers for your appetizers: Sicilian olives, prosciutto, house-made mozzarella or radishes with sea salt. Up one level in size are the antipasti, including many interesting veggie-forward combos: Red celery and fingerling potatoes; whole artichoke with mint; and cauliflower with spicy sopressata and pesto. I notice that now they have Bagna Cauda on the menu – which we certainly would have gotten! Our first chosen dish was roasted trumpet mushrooms with balsamic, arugula, and Sicilian almonds (above) – the mushrooms were woodsy, and almost meaty, and went well with the deep, aged balsamic. For a second “lighter” bite, we went with the fennel salad with oranges – one of our favorite dishes that we first tried in Siracusa, Sicily. There is something about the combination of fennel and oranges that is just perfect. Next was the “Little Fish” menu which featured grilled scallops with walnut, yogurt and marjoram alongside mussels and sea salt. From this section of the menu, we started out with cured sardines with capers, butter and dill on top of fettunta (bread rubbed with garlic – above). This was our favorite bite of the night – salty, savory and a perfect flavor combination. Sardines have really been growing on us recently, and these were the salty, savory bite showcased on some excellent bread. The “Big Fish” and Meat sections of the menu had much larger entrees and included grilled swordfish with sweet/hot peppers and mint and grilled veal flank steak with hot peppers. The pasta dishes are intended to be a starter course, as in Italy, but we basically ignored that advice. There were almost 10 pasta choices, and each sounded more delicious than the next: ricotta gnocchi with broccoli pesto, basil and pistachios; fettuccine with spicy lamb sausage; or potato-filled ravioli with crème fraîche, garlic and rosemary. From the pasta menu we chose the sheep-milk cheese agnolotti (mini, rectangular filled pasta pockets), topped with saffron, dried tomato and honey and Malfadine – flat pasta with wavy edges – with pink peppercorns and Parmesan. The malfadine dish was a great riff on cacio e pape. The simple Roman classic was elevated by the slightly thick, handmade pasta and high-quality Parmesan. The agnolotti was light and fresh, with a slight sheep’s-milk tang which shone through the light sauce. The handmade pasta was uniformly excellent. We finished off our meal with a seasonal apple galette with winter fruits- which was perfectly proportioned with flaky, crispy crust. Flipping the script – Lilia is also known for their soft serve (we didn’t sample it this time, but maybe we will be back)! The Italian-only wine menu is quite extensive, and they have the widest selection of amari (after-dinner bitters) we have ever seen! In the morning, and for lunch, you can visit a more subdued Lilia for coffee, pastries and panini. Though you may have to cut through the hype a little bit to eat there, we really enjoyed our meal at Lilia. The small plates were all perfect and simple in an ingredient-forward way, spicing up traditional flavor combinations and dishes. Lilia lived up to our standards for Italian food, and that is saying something! We think Venezuelan arepas are one of the most perfect foods: a carb-y masa shell, perfectly handheld, filled to the brim with tasty fillings (often including cheese!). Due to this perfect formula, it is no surprise then that arepas are increasingly popular worldwide. We even had arepas in Porto, Portugal (not to mention a few times in Chicago and Cleveland). One of my favorite arepa joints is located off the beaten path in Astoria, Queens, Arepas Cafe (33-07 36th Ave, Astoria, NY 11106). Lucky for me, Arepas Cafe is located conveniently near my cousin’s place, so I get to go there whenever I visit NYC. Arepas Cafe is a humble storefront that does a brisk takeout business. We started out our lunch with my favorite Venezuelan drink, the limeade-like, Papelón con limón ($3.50), which is like the best, sweetest version of lemonade you have ever had (or the Brazilian “Swiss lemonade”). For appetizers you can get mini versions of arepas, empanadas, and cachapas (fresh corn pancakes) or the classic fried yucca ($5 for any). Though the arepas are the main draw, you can also get heartier meat entrees including the Venezuelan national dish Pabellón Criollo ($13) – shredded beef, white rice, black beans, cheese and fried sweet plantains. The bulk of the menu is made up of arepa varieties (All of the arepas are $8 or less). There are combos for vegetarians and meat eaters alike – and we really enjoyed the Arepa Pabellón Pernil – roast pork with black beans, white cheddar and fried sweet plantains and the Guayanesa Tropical – Guyanese cheese (white fresh cheese), fried sweet plantains and avocado (pictured above). The pernil was tender and juicy and the sweet platanos maduros complemented the fresh cheese particularly well. Beyond our favorites, you can also get arepas filled with cheese, mushrooms, black beans, tuna, shrimp, chicken and more (I included my favorite arepa infographic above to give you some potential combination ideas). Arepas Cafe’s arepas are generously sized and delicious, and we have never been disappointed by our selections. Arepas Cafe is an absolute steal for NYC, and is the perfect place for a quick, hearty lunch. The iconic, long-running Veselka (144 Second Avenue, NYC) has been on our list of “to visit” places in NYC since we started going there regularly in 2006, but somehow we never made it there until our last trip over the Winter. It is kind of hard to pin Veselka (which means “rainbow” in Ukrainian) down. On the face of it, Veselka is a 24-hour Ukrainian diner – but with slightly higher prices and a huge line of club kids waiting to get in every night after hours (or at pretty much any time). Still, on the menu you can get Americanized brunches and the waiters rush you through with an efficiency that will make your head spin – bringing it back to a diner feel. In any case, Veselka has been serving up comfort food in the East Village since 1954, so we figured they must be doing something right to still attract crowds after all these years. There are no reservations – so we had to wait about a half an hour for our table of five. Fortunately it was an unseasonably warm day so we didn’t mind just people watching outside (a prime area for that activity). The menu at Veselka is extensive, and there are two basic genres of food available: American diner food and Ukrainian specialties. At our table we went with a little of each. On the Ukrainian side, the favorites were clearly the pierogies – or varenyky in Ukrainian – you can get them boiled or fried, with a myriad of fillings like cheese, sweet potato, mushroom, meat, and even the more esoteric goat cheese and spinach – all served with applesauce, onions and sour cream on the side. They also make a hearty borscht beet soup (either vegetarian or meat-filled- Pint $4.95 and Quart $8.95), and a classic Ukrainian “Hunter’s Stew” dish called Bigos with Kielbasa, roast pork and onions ($17.25). For even more Ukrainian flavor, you can also get kasha (buckwheat groats) and potato pancakes as side ($4 each). On the American side of the menu, you can get breakfast all day including waffles, omelettes, and pancakes with all of the trimmings. Burgers and other sandwiches like the Reuben and egg salad round out the offerings. M got a Veselka signature sandwich: the Baczynski ($15)which was piled high with Polish ham, Ukrainian salami, Polish podlaski cheese, pickled vegetable relish on pumpernickel. M really enjoyed the sandwich – but it was too big to eat in one sitting – even for him. I ordered a platter of 7 varenyky ($11), which was also a popular order at our table – and with good reason. The varenyky were the stars of the show, and the mushroom and goat cheese and arugula varieties were deemed to be the favorites. Opinion was split on if fried or boiled varenyky are superior, though I think my personal preference is for fried. To finish off the meal, Veselka has a range of diner favorites – you can order one of their ‘individual’ pies – which are really quite big! We got a New York staple – the black and white cookie – and a miniature banana cream pie ($7.50). Veselka serves up good, hearty comfort food with an Eastern-European flair – and we can’t think of a better place to get dumplings at 2 AM. If you’re looking for that “kid in a candy store” feeling, there is nowhere better to visit than Sockerbit (89 Christopher St New York, NY 10014) in New York City. The best part about Sockerbit is that, unless you are Swedish, you have probably never seen any these candies before, which makes the adventure all the more fun. All of the bulk candy in Sockerbit is sold by the pound ($12.99) so you can grab a bag and pick out your own perfect selection from the dozens (hundreds?) of varieties. Here is a preview of a few of the candies you can get. There is a huge variety of gummy candies, in any shape you could ever want, including old favorites like bears, worms, cola bottles and fish. But the fun doesn’t stop there, the beauty of Sockerbit is that there are also dozens of particularly unique shapes like sour apple skulls, pink dolphins and raspberry Ferarris. Traditional Swedish licorice in both hard and soft varieties, some of which is super strong and almost spicy, like the hard Napoleon variety. Other varieties like Salmias are salty! In addition to the overwhelming amount of candy, Sockerbit also has a small assortment of Swedish ingredients like coffee, jam and flour along with boxed candies and cookies. You can also buy modern Dala Horses and and housewares, if you are looking for something a little more durable. Plus, Sockerbit is also one of the few places you can find the famous Swedish Polkagris candies in the US. If you can manage to save some of your candy haul, these also make a great souvenir! The neighborhood of Astoria in Queens, NYC is known for its huge Greek population (which is still growing today), and accordingly, you can find some of the best Greek food in the city (and country) in this one neighborhood. It also means that a diversity of Greek and Mediterranean cuisine not seen elsewhere abounds. We were happy to find that one of the few Cypriot restaurants in the US was located in Astoria, Zenon Taverna (34-10 31 Avenue, Astoria, NY 11106 ). Cypriot food is similar to what most Americans think of as typical Greek food, but with more Middle-Eastern influences, given its history and location. The menu at Zenon is staggering, with a huge option of cold and hot meze appetizers including favorites like hummus and tzatziki as well as more unusual options like quails and stuffed mushrooms. For entrees, there are dozens of pitas; chicken, lamb and fish platters; as well as meat and veggie samplers. Each day, there are also upwards of 6 specials including: Keftedes Kypriaki ($10.50 S / $17.99 L) pork and potato meatballs; Louvia me Lahana – blackeyed peas with Swiss chard ($6.50 S / $12.50 L)and pastitsio (a lasagna-like layered lamb dish). We didn’t really know what to pick, so we went with 2 samplers to share among our group, along with an appetizer of char-grilled octopus ($17.95) and Cypriot rabbit stew on special for the day- Kouneli Stifado ($19.95). The Cyprus Meze sampler ($24.95 a person) came with a total of 16 meze – 8 hot and 8 cold. Everything was bright, fresh and delicious, but there were a few standouts. Zenon did a great job with classics like tzatziki and hummus, but we really loved some of the more unusual choices like the tarama – carp roe with potatoes and the fresh, vinegar-y pantzarosalada – beet salad. In terms of the hot dishes, there was a heavy emphasis on fish and pork. We highly enjoyed the smoked pork loin – lunza, the loukaniko spitisio – Cypriot pork sausage cooked in wine – and the keftedes arnisia – garlickly lamb meatballs. Of course another winner was the baked sheep and goat milk cheese halloumi, doused with lemon juice. The octopus appetizer we ordered was another favorite, and the special-of-the-day rabbit stew cooked in red wine was tasty, if a little game-y. If you leave room for dessert, there is baklava and semolina desserts like siamali and halouvas, which you can wash down with a traditional frappe or Greek coffee. Alas, we did not leave room, since our Cypriot Meze order was so huge! We are a big fans of Greek food, and we really enjoyed trying something a little different at Zenon. One caveat – they are cash only! This is not a super-cheap place, so we went to the ATM in advance instead of testing our luck with the ATM around the corner. We recommend you come to Zenon with a crowd – there are so many dishes and mezes to share – the more, the merrier! We think we have found the best Indian food in NYC – in the basement of a Hindu temple. The Ganesh Temple Canteen (45-57 Bowne St, Flushing, NY 11355) is tucked into a quiet, residential neighborhood of Queens – you wouldn’t know the temple was there until you drive right up to it and see the ornate architecture up close. In order to reach the canteen, you descend the stairs to the basement, where you are greeted with a vast, simple cafeteria, complete with linoleum floor and buffet line. But don’t let the humble presentation fool you! At almost any part of the day, the cafeteria will be packed with worshipers and non-affiliated neighborhood folks alike. The canteen has been churning out food since 1998, and attracts crowds a all times, even at breakfast. The focus of the canteen is vegetarian South Indian dishes, in particular: dosas. The vast range of dosas, thin wheat crepes, come with a variety of fillings from spicy potatoes, to lentils and chilis, to paneer cheese. And you’ll be pretty pleased about the prices, too (nothing is over $7). You wait in line to place your order, and while in line you can check out at the menu on a suspended flat-screen TV and consult with the dosa experts in line. There are also a range of appetizers like iddli (steamed rice cake) and vada (savory fried dough) to go with your dosas, as well as a selection of sweets and mango lassis. There are also a few additional temptations while waiting: little boxes of sweet and savory snacks for sale to take away. Looking around the room, you will notice some hints that the restaurant is attached to a Hindu temple, including the prominent statue of Ganesha. We ordered a side of tamarind rice, two masala dosas and a Pondicherry dosa. After no more than 10 minutes, our food came out, fresh off the griddle. Dosas are usually pretty generous in size, and these were no exception. The dosas themselves were butter and flaky, and were completely packed with delicious vegetarian fillings. The potato filling of the masala dosas were perfectly spiced – just the right amount of heat. The Pondicherry dosa was also filled with green chilis and onions, which added an extra kick. We also appreciated the soupy veggie sambar and coconut-yogurt sauce that came alongside. We washed everything down with a mango lassi (which is a bargain at $2 – you may want a second one). The Ganesh Temple Canteen may be a little out of the way for most New York visitors, but it is definitely worth the trip for the great hospitality and the tasty dosas. This is some of the best Indian food we have ever had, and definitely the best we have had in NYC. Plus, you’ll get a huge amount of food for the price! If you stop by, don’t forget to indulge in a mango lassi (or two). We are going to NYC and Toronto next week, and we are looking forward to eating everything under the sun. We haven’t been to NYC for year – do you have any recommendations for any new food finds we may have missed in the past year? Plus, we are really excited to experience the multicultural foodie heaven of Toronto. We have never been to Toronto together, what should we try there? Let us let you in on a little secret – we know where they have the best pie in New York City: Petee’s Pie Company (61 Delancey St, New York, NY). Petee’s is a blink-and-you’ll-miss-it small shop on the Lower East Side, and we make it a point to visit it each time we are in NYC. M has gone far enough to say that this is his favorite pie ever. Knowing how much M loves pie (and how many pie places we have tried), this is a pretty bold claim. Petee’s is run by Petra “Petee” Paredez – who has pie-making in her blood – her parents own the Mom’s Apple Pie Company in Leesburg, Virginia. We are loving the proliferation of pie shops around the US and are so happy that the quality keeps going up as more people- even city dwellers – are becoming more discerning about pie. We have been to Petee’s several times, and every slice is better than the last ($5 for a slice, $30 for a whole pie). On our last few visits we have tried Rhubarb, Salty Chocolate Chess, Cherry Crumb, and Blueberry, each of these pies has been absolutely delicious. M has even become a rhubarb convert due to having one of the pies here. In particular we are fans of the flaky, tender crust that is neither soggy nor too crisp. We always look forward to visiting Petee’s because there is always something new, and the seasonal flavors are a must – the Cardamon Pear we had in October was scrumptious. There are also savory, vegan and gluten-free pies (and even cheesecake) at Petee’s as well as an assortment of tea drinks. You can even get a frosty glass of cold milk along with your pie, which M considers to be a must with every pie experience. We are also particularly grateful to Petee’s for introducing us to the concept of the pie fork, a once-popular utensil that has one extra-large tine for cutting the pie and scraping the plate. We look forward to visiting Petee’s the next time we are in NYC, and you should go too – tell them we sent you! Our over-the-top icy treat of choice in Chicago was the Mangonada, but on a trip to NYC (I think we were driving by this place) we recently learned of a Colombian answer to this fruit/ice/cream/sugar concoction – the Cholado. A cholado consists of shaved ice, topped with fruit syrup, fresh fruit, coconut flakes and sweetened condensed milk (and maybe even a cookie). Though the cholado recipe can vary by region (or country) the traditional syrup flavors include passion fruit and mora (Colombian blackberry). Cholados are also found all over Jackson Heights, Queens if you can’t make it to Colombia, and Serious Eats has a power ranking. Find a recipe for a DiY cholado at Sarepa (if you have access to tropical fruit) or Ezra Poundcake and My Colombian Recipes (if you don’t). Okay, vegetarian and vegan readers, now is the time to look away. So you probably already have, given the leading picture on this post. If you were wondering about that pictures, yes, the entire ceiling covered with meat, spicy Calabrian dried and cured salami, soppressata, to be exact. The Calabria Pork Store (2338 Arthur Ave., The Bronx) in the heart of the Bronx’ Little Italy, is a real throwback, and is one of the only places you can see meat hanging up at a butcher (a practice that used to be common). The soppressata, for which the shop is rightly famous, comes in mild and spicy varieties, and you can buy a whole or half link. However, the soppressata is only half the story, you can buy all manner of other fresh sausage and cuts of meat behind the counter, by unit or weight. To make a meal of it you can also buy provolone, olives and other cold deli items. M got a tub of sliced, cured Calabrian sausage to eat throughout the day in the manner of potato chips. It’s worth it to visit for the atmosphere alone, but the soppressata is the real deal, and is a must-try for any lover of cured meats. Seeing Dr. Brown’s soda on the shelf is a blast from the past – I remember having Dr. Brown’s soda occasionally when I was a kid (Cream Soda was my main pick), and the packaging alone really stood out. 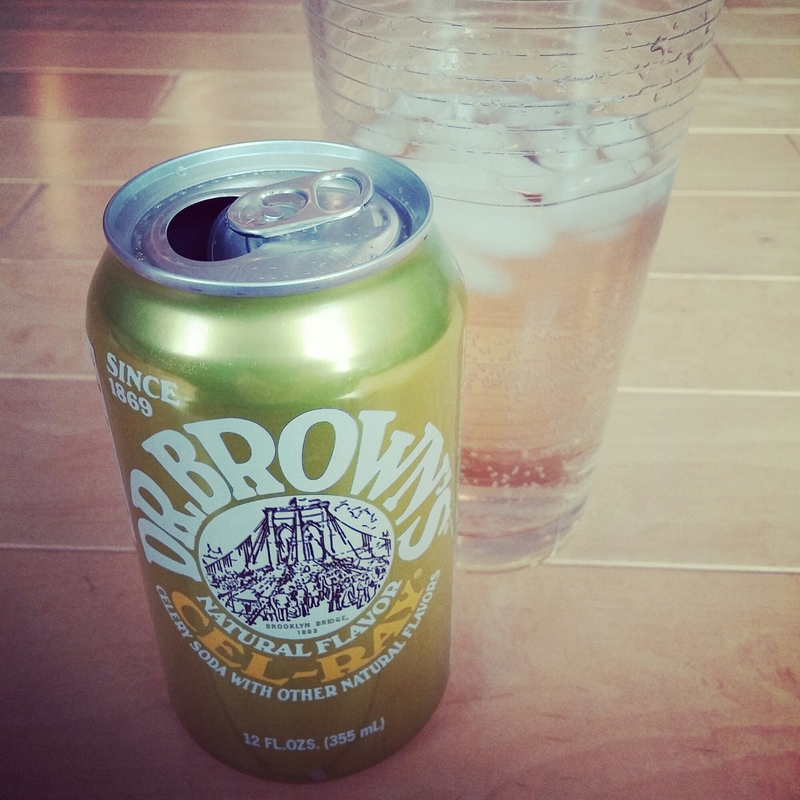 Dr. Brown’s is a long-running NYC soda brand with flavors like Root Beer and Black Cherry associated with the classic NYC Jewish deli (where it was sold exclusively until the 1980s). Though it is now more widely distributed, Dr. Brown’s is still the kind of thing you won’t see in every shop, so I was really surprised when I came across their Cel-Ray flavor in a little shop in town. Cel-Ray soda is their most famous and most unique drink, made from celery seeds. Cel-Ray debuted in 1868 and was marketed at the time as a quasi-medicinal “celery tonic.” Serious Eats has a great history on the soda if you would like to learn more. So onto the soda itself – the drink was fizzy and pale champagne colored, and it tasted nothing like celery, and was more akin to a crisp, light ginger ale. I liked it – and can definitely see how it would pair well with fatty deli sandwiches. Alton Brown even has a recipe to make your own! Hanukkah is coming up – which means we are in prime babka season. Babka (aka Krantz cake) is a sweet Eastern European braided bread that has become a staple of New York City Jewish cuisine. I have tried a few babkas and I think I can definitively say I have tried my favorite in NYC so far – Breads Bakery (18 E 16th St, New York, NY 10003). Breads is the run by Israel-born, Denmark-trained baker Uri Scheft. At Breads, Scheft updates a variety of bakery classics including challah, rye, cookies, baguettes, croissants and even sufganiyot for Hanukkah, but the babka is the standout. Breads’ version is different from the traditional babka since it is made with a hazelnut spread / chocolate filling instead of just chocolate. Despite not being the most traditional, there is a whole lot to love. Breads’ babka is soft, gooey and completely bursting with chocolate and hazelnut goodness. There is even a cinnamon version! We are not alone in our praise, and Breads also got a hat tip for best babka in NYC from Serious Eats and New York Magazine. Breads even makes a babka pie! We will definitely be back the next time we are NYC. Who makes your favorite babka? When we were at the Long Island City Flea & Food Market this fall we were surprised and pleased to find a stall selling Bangladeshi food, Jhal NYC. Jhal NYC serves street food from Bangladesh including Fuchka and Jhal Muri (a puffed rice snack). Fuchka is popular around the Indian subcontinent and might be known in other areas as puchka, panipuri and golgappa. Fuckha consists of a series of small crispy dough shells, topped with chickpeas and potato stew along with other garnishes, including green onions, chili peppers and cilantro. Another key aspect is that it is then topped with (or dipped in) a light tamarind water. The fuchka was a delicious mix of complex flavors, and the crispy shells perfectly complemented the soft chickpeas and potatoes. Here is a recipe from Archana’s kitchen for the dough shell and here is a recipe for the Bangladeshi-style filling; or a simplified version that has both parts of the recipe. Fuchka was such a delicious snack – we can see how it is so popular across so many different regions. There is nothing we like more than street food, so we were super pumped to try Sri Lankan street food for the first time. 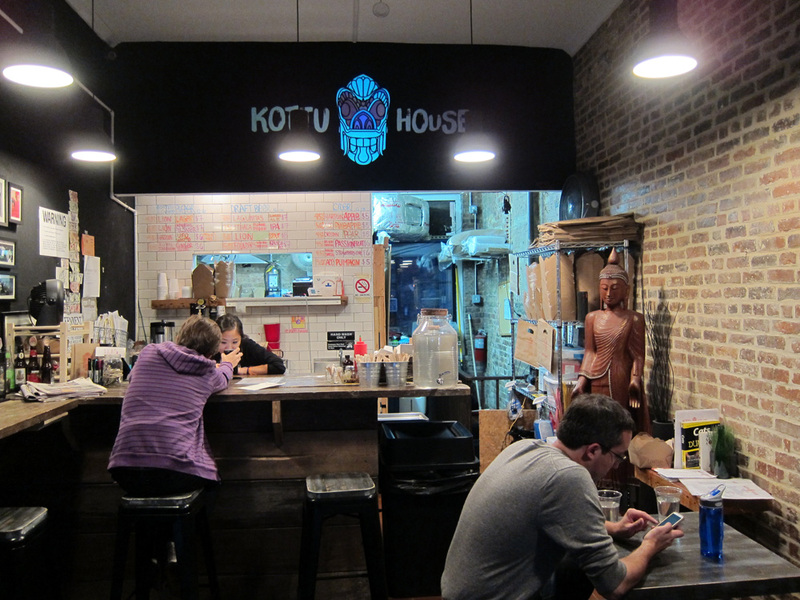 Kottu House (250 Broome St, New York, NY 10002), is a postage-stamp-sized Sri Lankan restaurant tucked into a corner of the Lower East Side, with only a few tables and a tiny bar (though you can do takeout as well). The resaturant is a study in contrasts, guarded over simultaneously by a strobe light image of a neon dragon and a calm wooden Buddha figure. Previously, most of NYC’s Sri Lankan food had been found on Staten Island, so this location is definitely striking out on its own. Kottu House primarily serves its eponymous dish, Kottu, which is a savory stir fry that falls somewhere within the triangulation of fried rice, flatbread, and a dry curry. The base of the kottu is chopped rotis (which almost takes on the texture of noodles) fried with veggies, egg, and a spicy sauce. To go along with your kottu there are a variety of fried sides and an interesting selection of drinks, including a decent array of unusual (think pomegranate) hard ciders, as well as ginger and Sri Lankan teas. There were a variety of proteins available with the kottu. Our server told us the chicken was the most traditional choice while the prawn was the most popular. There was also a “Little Italy” kottu that had tomato sauce and chicken sausages, as a nod to the proximity of Little Italy. For any protein, you can order your kottu with varying levels of spiciness from mild to “Sri Lankan spicy,” and the mild was described as closer to American “medium.” If so desired, the dishes can even be made vegan (or just without egg if that’s your mood). Sticking with the more traditional options, L selected chicken in “mild” and M went with the pepper beef in “medium”. The kottu comes in two sizes, small (for between $7 and 9) and large ($12 to 15). During happy hour (4 -7 pm) you can get a small for only $6. For an extra kick you can order one of 3 sombols, chutney-like side condiments meant to mix into the kottu. We ordered the pol sambol which is fresh grated coconut, Sri Lankan chili powder and lime (which was described as medium) a milder sombol – minchi sambol – with green chiles garlic and mint, and a fiery hot one – lunu sambol – with raw red onions, chili powder and lime. 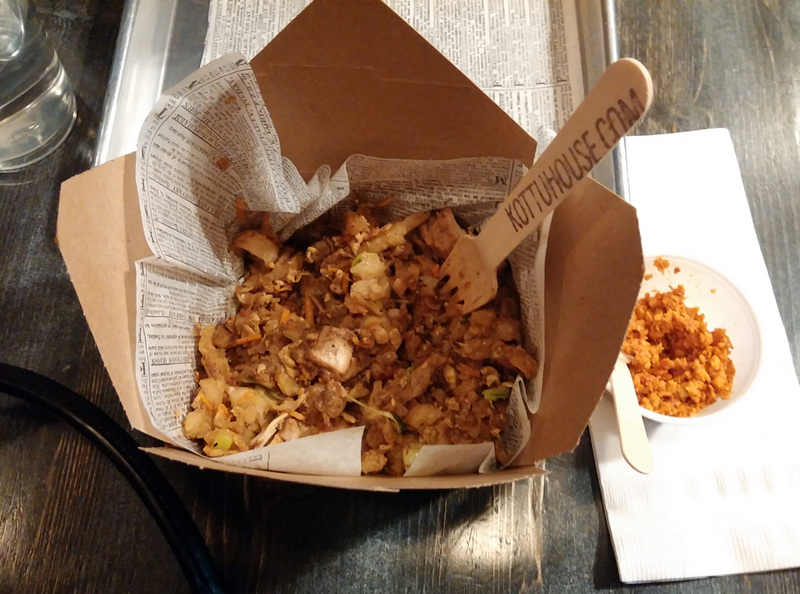 The kottu came out in short order in paper takeout boxes, and our server instructed us to mix in the chutney right away to heighten the flavor of the dish, which really worked! The kottu was reminiscent of a spicy fried rice, but the bread as a starch gave it a very different texture. The overall flavor was salty, spicy and finished with a bit of lime, the mild was about a “medium” so keep that in mind. The kottu was delicious, satisfying and savory, real Sri Lankan comfort food. As such, kottu is the perfect food to grab and go, and would be an ideal way to soak up some late night drinks on the Lower East Side. Being cheese lovers, M and I absolutely jumped at the chance to try what my cousin deemed “the best grilled cheese in Astoria” at the Queens Kickshaw (40-17 Broadway, Astoria, NY). The vibe inside was warm and cozy, and had the feel of a gastropub. There was a small but well-curated menu of grilled cheeses, along with burgers, soups and some other entrees. Not to mention a full menu of imported beers, coffee drinks and even mead. As for the grilled cheeses, Queens Kickshaw had the classic rendition of a grilled cheese, Cheddar & Mozzarella ($8.5) on a brioche roll, which was even served with a comforting cup of tomato soup. M got the gouda grilled cheese ($10), topped with black bean hummus, guava jam, pickled jalapeños, and with a side of green salad with jalapeño vinaigrette. L got a tomato burrata grilled cheese, ($12) on herb focaccia with heirloom tomatoes and herb pistou. How can we resist anything with burrata? We figured they also would do other cheese-based dishes well, so I had to try the Mac ‘n Cheese ($14) which had a mix of Gruyere, cheddar and smoked mozzarella. The sandwiches were delicious and the cheese and bread were both extremely fresh. We also appreciated the interesting add-ins like black bean hummus and herb pistou that elevated the sandwich to another level. The gouda and black bean was definitely one of the best grilled cheeses we’d had recently, and we’d venture to say that it may be one of the best in the city. Not to mention that the Mac and Cheese was absolutely killer. What could more comforting (and tasty)? 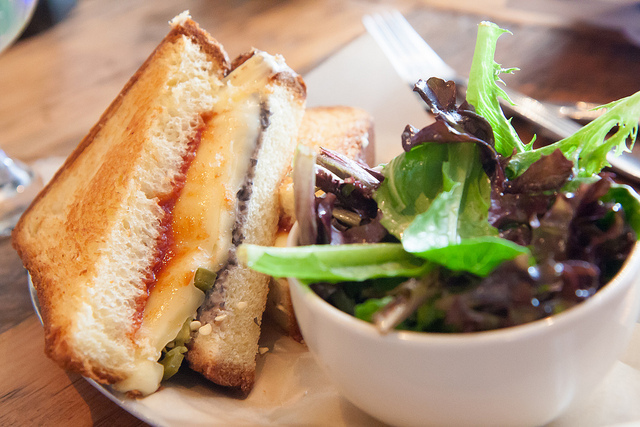 The Queens Kickshaw is definitely worth a stop if you get a craving for grilled cheese!